An asterisk at the beginning of a string of characters. An example is *BEX. All item numbers ending in BEX will be considered in the item number range. An asterisk at the end of a string of characters. An example is BEX*. All item numbers beginning with BEX will be considered in the item number range. An asterisk at the beginning and the end of a string of characters. An example is *BEX*. All item numbers that include the characters BEX somewhere in the item number will be considered in the item number range. 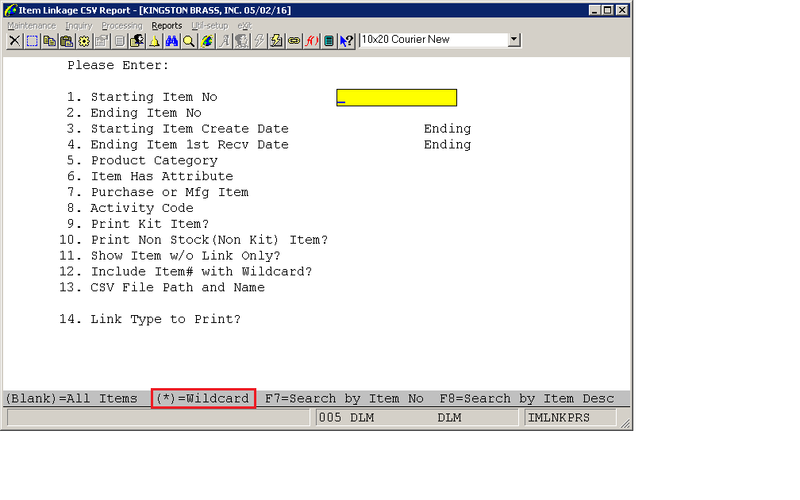 If the user enters a Starting Item with a wild card character (*) in the starting item number field, then the application will skip the ending item number. If the user did not enter a wild card character in the starting item number, and enters a wild card into the ending item number, this is an error condition and will not be allowed.